Media2Movements | Social Media #22: Think mobile first! When you think about online strategy you have to think of the four inch screens first. If you are an admin of a Facebook page you can quickly check what I mean. Find you statistics and you will see the percentage of people that approach your page on a mobile. On different pages I am involved in, this is around the 80%. This means that 4 out of 5 people visit your posts on their mobile. Want a double check? Open Google Analytics, find the tab ‘Mobile’ overview of your pages inserted and you will probably find between 45-55% of the people access your page on a touch screen (mobile or tablet). That’s 1 of every 2! If your strategy is build on a customer journey from an mobile platform (like Instagram for instance) towards your website, you need to be aware of the fact that 100% of the leads will land on your page on their phone! So… how responsive is your landing page? Apart from these facts, the mobile trends of this world (and [y]our world?) are very much about building apps for everything. The mobile phone is getting more and more a remote control for life! We order in food, Uber ourselves out across town, update our Under Armour fitness progress, share and track our Nike+ runs, take care of our laundry online, monitor our sleeping pattern, organize our contacts and schedule our water needs. It is interesting to see that most of the apps that are very popular are apps that let others earn money. Uber helps people with cars earn money for a ride across town (their commission is about 20-30% of the price), Airbnb helps people to earn money when they rent out their couches (commission around 10%), Laundrapp is helping cleaners and dryers to earn money through their app. All those apps are very service providing and supporting the lifestyle of the customer. Maybe something to think through when you struggle with your mobile strategy: how can we support life stories? The mobile phone is getting more and more a remote control for life! And these mobile trends are changing more than you can imagine. 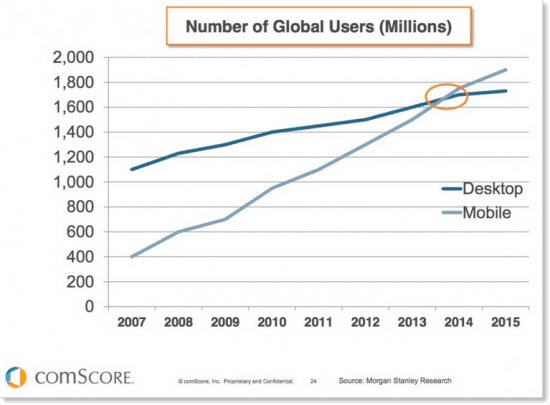 Already somewhere in 2014 there was the tipping point when mobile overtook desktop as in global users. In the slipstream of this we see the time spent on vertical screens rising and horizontal screens declining. Apps like Snapchat are changing the way we watch video and is driving this vertical trend. Before you decide to ride this vertical wave, you might want to consider to discover the trend of the 360 video and entering the world of virtual reality. Most of those trends are futuristic for most ministries, but allow you to dream about augmented reality or other latest trends can be helpful to understand new possibilities and open your eyes for a smaller more doable step for your mission. Maybe you can’t build an Oculus of $ 1999, but can provide the world a cardboard VR experience. Sometimes genius thinking is driven by simplicity, KISS (keep it simple stupid).